It's the best system because it's your system, strive for perfection! The new Alphacool NexXxoS UT60 X-Flow Server Radiators help you to get one step closer! Increase the performance of your system with the new Alphacool NexXxoS UT60 X-Flow Server Radiators. For the best possible cooling of your system, Alphacool relies on the X-Flow for the new NexXxoS server radiators. 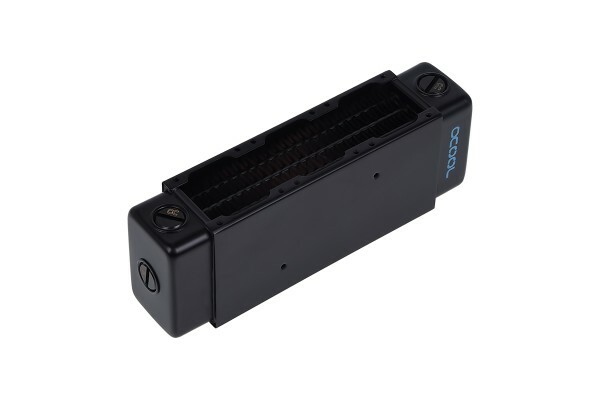 The flow runs from one side of the radiator to the other and directly uses all fins. Your Alphacool NexXxoS UT60 X-Flow immediately achieves the best possible cooling with optimized water circulation. For the first time Alphacool has countersunk the screw plugs. This unique design allows you to stay flexible with the positioning of your Alphacool NexXxoS UT60 X-Flow Radiator. Mount your radiator the way you need it. Thanks to the multiple inlets and outlets, you have more options to create something unique and more importantly efficient. The radiator of the new Alphacool NexXxoS series is also made of solid copper ensuring the radiators offer you the highest thermal conductivity for the best performance. Rely on the No. 1 in materials. The new Alphacool NexXxoS UT60 X-Flow is available in different sizes and thicknesses. All radiators of this series are compatible with 2U server racks. Thanks to the special shape, installation is child's play, even with the larger radiators. Decide for yourself which size is perfect for your system and always choose the best quality.